The ZZ plant looking like stegosaurus than actual plant and will survive extinction-level neglect. The green ‘fronds’ look like a cross between a cycad and a philodendron. In the Chinese community, it is also referred as the ‘Money’ tree because of it’s thick leaves that’s growing upwards. Even if you miss watering or there’s little amount of natural light, you can rest assured that it is still looking naturally. However, do give it a trim to keep it light so it won’t look bushy. One of the most luxurious houseplant around, with fans of deep-green, glossy fronds on a compact clump of bamboo-like stems. Although they’re growing at a slow rate, but this plant can live indoors the whole time with much care. Keep the potting mix moist and annually feed with palm fertilizer to get Lady palm growing healthily. But, if the plant is root-bound, just divide them with sharp knife on the root ball, then pot up the divisions. Adding this luxurious houseplant in your AlamImpian house will turn to make it look even posh. Peace Lily or Spathiphyllum can live in low light but for it to bloom could be a challenge. That doesn’t matter because the glossy leaves is good enough to be attractive on its own – as a table centrepiece. But do clean and trim the leaves once in a while as it tends to grow brownish on the tip of the leaves. Besides, the benefit of having peace lily in the house is an efficient natural filters, making the air fresher and safer. It’s good to have it at home, for the kids to have better air quality. The common houseplant and easily available in the market, it is easily identified with blotchy-looking golden pothos vine. Pothos is easily to take care of and can leave it to sustain by itself. Well, still need to trim as well, if it get’s leggy, just prune it back and cut the roots into new flowerpots. This houseplant has been a trendy one in fashion industry with it making appearances in fabrics. Well, you won’t be missing out the trend now to fit into your trendy and contemporary AlamImpian house. Philodendron (philodendron hederaceum) is a common heartleaf that looks like divided leaves of the split leaf philodendron, it has crown of lime-green foliage. Periodically check the leaves and the stems from pests and remove any yellow leaves. Do keep the potting mix moist for it to be healthy. Also as known as moth orchids. An exotic flower plant that looks good for the dining table centrepiece, turning the whole atmosphere more elegant and refreshing. Apart from being the focal point, it’s also works as a filter for air pollutant. The tall stems plant making the look and feel elegant with the leathery leaves and flower bloom on the top of the stem. It requires lesser direct sunlight which means you can place it where it is shadier for the right amount of sun and shade. Most important, this orchid requires weekly watering, that’s all! 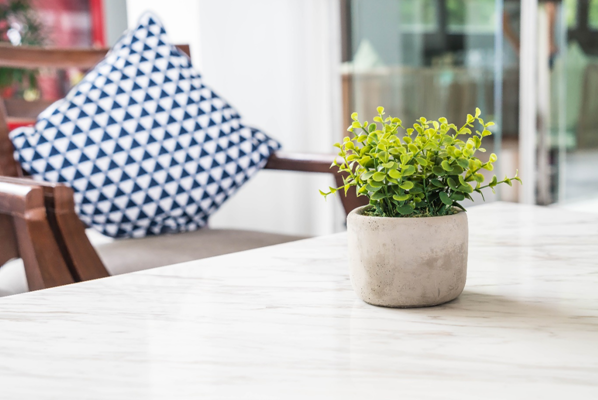 It’s easy to not love this houseplant for it’s minimal care and aesthetic. Lucky bamboo is not a bamboo at all, but it’s a species called Dracaena sanderiana. With the name lucky bamboo, it surely does look good for fengshui, it is said to bring good luck and fortune for being tough and strong. The durable and indestructible lucky bamboo does not need constant and regular care. They are so tough that they can survive in vases of still water or in the soil, also in variety lighting conditions. A well taken care and groomed lucky bamboo can worth up to thousands.